Wondereur transforms how ownership is experienced – beyond the world of art – by leveraging technologies such as augmented reality to push the concept of linking storytelling, collecting and technology. Wondereur links content creation and e-commerce. The company is currently focused on building and presenting visual storytelling, in the form of weekly photojournalistic essays that are featured exclusively on its digital platforms. The stories reveal the inspiration, dreams and struggles of contemporary artists, whose art readers can buy directly from the iPad app. Wondereur is a Webby Awards 2014 Official Nominee and a Gold winner of the 2012 Canadian Online Publishing Awards. Wondereur participated in the second cohort of IDEABOOST with its iPad and web app that invites you to explore their world through the lens of today’s artistic visionaries and creative risk-takers. Escape into a hidden world as users encounter the stories and moments that take them closer to the source of art and creativity. Each week, a new story unfolds and art world insiders introduce a body of work that is made available for purchase to Wondereur readers. 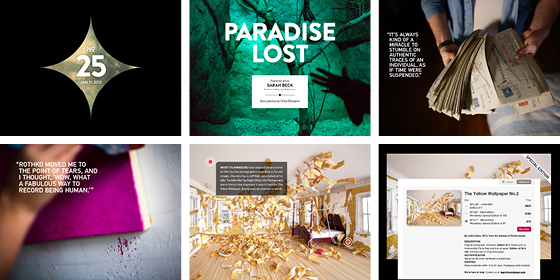 Wondereur promises to dazzle and delight with the highest standards of photojournalism, storytelling and interactive design. Published by a team of passionate designers, journalists and entrepreneurs in Toronto, Canada, Wondereur is more than a magazine. It is a journey, an adventure, a movement that aims to deepen our relationship to artists and support them on their quest to show us the world through their eyes. By combining an intimate photo story and a pop-up art store, Wondereur revolutionizes the way people buy art. Users discover who to invest in now and get to know the artist in a more personal, meaningful way. This is a first in both the art and digital worlds.